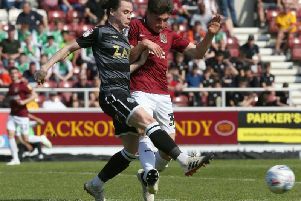 Regan Poole is set for a swift return to Northampton on Friday night as he is expected to be part of the Manchester United XI squad heading to the PTS Academy Stadium for a pre-season friendly (ko 7.45pm). And the Welsh youngster is looking forward to coming back to a club where he says he enjoyed ‘a rewarding experience’ during his year-long loan last season. Old Trafford youngster Poole was signed by then boss Justin Edinburgh 12 months ago on a season-long loan deal, with the pair having worked together at Newport County. Things didn’t work out particularly well for Edinburgh, Poole or anybody at the Cobblers as the campaign saw three different managers at the helm, and also ended in relegation to Sky Bet League Two. But it was certainly not a waste of time for Poole, who turned in several excellent performances either in the heart of midfield or at the centre of defence. In all, the Wales Under-21 international made 20 starts and four substitute appearances in the claret and white, before somewhat surprisingly being more or less completely overlooked from the beginning of February - making just one appearance after that in Dean Austin’s first match in temporary charge on April 10. Now aged 20, Poole has returned to Old Trafford and has settled back into life in the Red Devils’ Under-23 squad, and spent last week on a training camp in Austria with Ricky Sbragia’s team. On Tuesday they drew 2-2 with Stoke City Under-23s, with Poole platying the first 57 minutes, and he will be hoping he gets a runout on his old stomping ground this weekend. “It’s good to be back (at Manchester United),” Poole told MUTV. “I obviously know all of the lads from when I was here before. Talking of his loan spell at the Cobblers, Poole said: “I enjoyed it. ”Obviously, I went there because of the manager (Edinburgh) who I worked with before, but the first couple of games didn’t get off to a great start and he ended up moving on. “I went through a fair few managers in my year there but, at the end of the day, I got around 25 games. It was a little bit of an up-and-down season for me, but it was a rewarding experience. “These days, it’s harder and harder getting out on loan and you’re never guaranteed to play wherever you go. “The aim for a young player to go out on loan is to get as many games as you can and the more games you play, the better it is for you, and that was my aim. “I played most of my games in central midfield, I think, and then, towards the end of the season, I moved further back when there were a few injuries. “I played right-back as well and, wherever the manager asks you to play, you do it. “I’m learning both positions, I’m still quite young so I’ll try to do the best I can. It doesn’t bother me where I play, centre-midfield or centre-back, I enjoy both, to be honest, so I don’t really mind. Although now back with United, Poole admits he is interested on going out on loan again. “Obviously, this time last year I was already gone, so maybe this season it might be a little bit of a longer wait to see what happens,“ he said. “I’m not in any rush. I’m happy here for as long as I can be, but the aim is to go out on loan - I’m just not too sure where really at the moment.